A big neon restaurant sign, good food and cheerful music — this is Gran Horizonte, the installation curated by Justin McGuirk, design critic for The Guardian and director of Strelka Press and Urban Think Tank, the multidisciplinary design studio, who together won the Golden Lion for best international installation at the Venice Biennale in 2012. 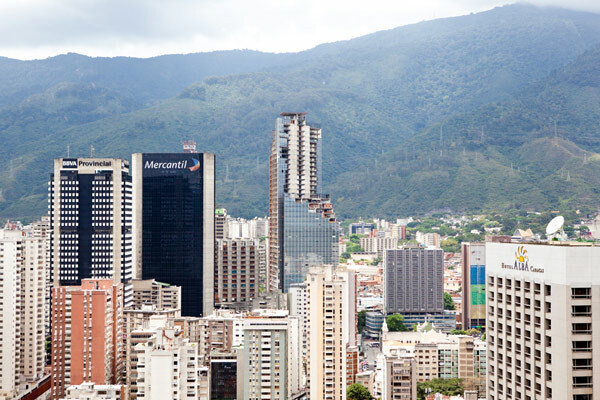 The space hosts the research project developed in Caracas into the biggest vertical slum in the world: Torre David. Gran Horizonte symbolizes “the economic south looking towards a political equator that divides it from the wealthier northern hemisphere. But it also refers to horizon of Caracas itself, and the view the residents of the tower have out to the slums on the edge of the city, where they would ordinarily be living” explains McGuirk. A victim of both the 1994 Venezuelan economy crisis, and the death of its developer David Brillembourg in 1993, the office building known as Torre David was abandoned before it was completed. Its unfinished silhouette has punctuated the city’s skyline for almost twenty years. The economic crisis of the early 90s made the severe housing shortage in the country even worse during this period. Increasingly, people started to occupy abandoned spaces like Torre David, ignoring the increasingly precarious safety conditions, lack of lifts and absence of amenities such as water and electricity. Day by day, the space became a real community, housing more than 750 families within its 45 floors. It also hosted commercial ventures, as shops, meeting spaces and sporting facilities opened to meet the needs of its residents. Regardless of political feeling, the superb photographic report by Iwan Baan records 45 stories of the residents living and working in Torre David. These images illustrate that, whilst the living conditions within the building are far from ideal, the sense of community it has created has generated exciting social projects, the like of which we are unable to find in the social housing of our own European suburbs. A book about the exhibition, done in collaboration of the ETH Zurich will be released in October, with a feature-length documentary Gran Horizonte set for release next year.